Monhegan Island is everything I love about Maine. Being about 8 miles off the coast from Boothbay Harbor, it's not that easy to get to and part of it's appeal. It's authentic, relaxed, and incredibly beautiful and when you step off the boat and touch land you know something is just different there. As a Maine wedding photographer I couldn't be more thrilled to be invited to photograph Amanda and Obie's wedding. Obie is a Lobsterman and this was his special place. They were married on the hill side by the Cabot House overlooking the Atlantic Ocean. 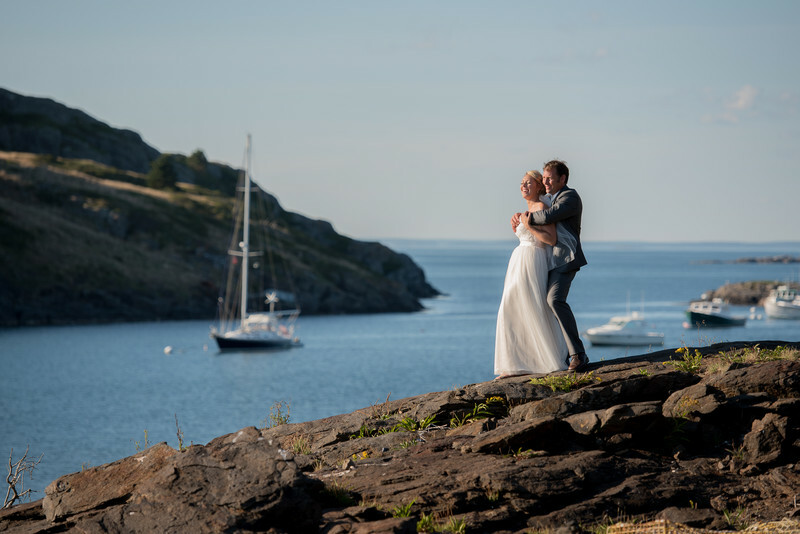 This image was taken just after their ceremony over the harbor of Monhegan Island. The wedding reception was at the Monhegan House where the party lasted all night long. I think this image captures it all when I think of Monhegan Island wedding photography.